Usage: Cashmere really shines when used for aroma and flavor in hop-forward styles, or where the intensity of its exotic tropical notes will complement sour, fruited, or funky ales. 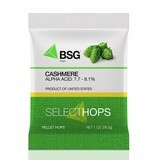 Its respectable alpha content combined with low cohumulone lets it contribute smooth bitterness if used early in the boil. Aroma & Flavor Characteristics: Complex and intensely fruity, with strong overtones of lemon, lime, peach, and melon. Secondary notes of coconut, lemongrass, candy, and herbs can show through in whirlpool or dry hop additions. Nelson Sauvin hops bear the name of their closest aroma descriptor, Sauvignon Blanc grapes - "crushed gooseberry" is the term most commonly used.